Here's what I have ... an service consisting of (2) 400A, 120/240V, 1ph panels, each being fed with (2) 250kcmil copper per phase and neutral. I have a 4" metal water pipe (more than 10' in contact with earth) and a #5 rebar stubbed out of the footing as my grounding electrodes. I want to set up my grounding electrode system this way ... mount a 1/4" thick x 2" wide x 6" long aluminum bus on the wall above the lay-in ceiling at the service location. A 2/0 copper GEC will run from the 4" water main to the grounding bus. A #4 solid copper GEC will drop down and connection to the rebar. One 1/0 copper GEC will connect from the grounding bus to the neutral bar in each of the (2) 400A panels. (one 1/0 for each panel) The GECs will connect to the bus with standard one-hole lugs bolts to the bus bar. Does anyone see a problem? This seems to be allowed under the new language of 250.64(C)(3) in the '05 NEC. Other than the bus and all connections being accessible, is there any other consideration to look at? 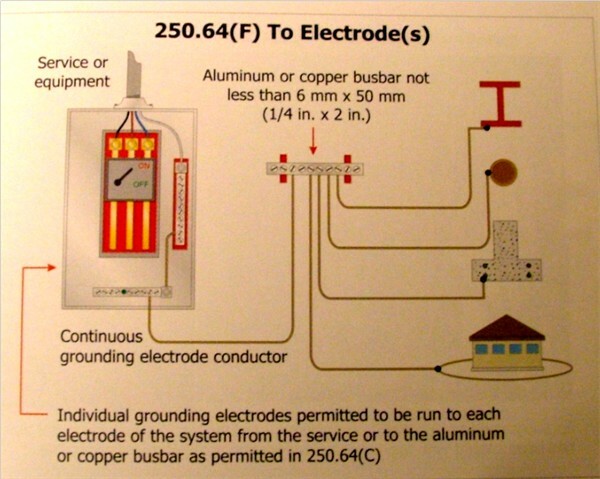 My understanding of the new provision in the '05 code is that the parallel 1/0's from the busbar to the service panels are the unspliced GEC and that all the available grounding electrodes can then be connected to the busbar. Does this make sense? As long as your operating under a permit that was pulled after the 2005 was adopted or the inspector will allow using a 2005 change on an earlier permit it sounds fine. I am looking at the IAEI 2005 NEC Analysis of Changes and what you describe sounds like exactly what they show. All you need is a listed connector at the busbar. It is not required to be irreversible. The footer is also a grounding electrode not just the water main. Also keep in mind that this allowance of a grounding bus is new to 2005. Shortcircuit, I do not have the 2005 CD-Rom I will try my best to type out (3) & (4) exactly as printed. I have shortened (1) and (2) they are similar to 2002 just laid out different. (3) Bonding jumper(s) from grounding electrode(s) and grounding electrode conductor(s) shall be permitted to be connected to an aluminum or copper busbar not less than 6 mm x 50 mm (1/4" x 2"). The busbar shall be securely fastened and shall be installed in an accessible location. Connections shall be made by a listed connector or the exothermic welding process. 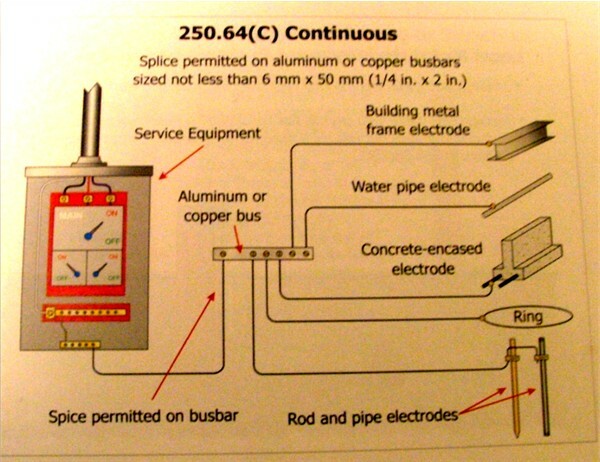 (4)Where aluminum busbars are used, the installation will comply with 250.64(A). This change that allows a grounding bus is not a big change in my opinion. Previously we could use any grounding electrode as a grounding bus. I could run (and still can) a continuous GEC to building steel or a water pipe etc. Then I could run separate bonding jumpers to as many grounding electrodes as I wanted. I had a service in a steel frame building about 300' from the water main, I ran a GEC from the service to building steel. Then on the other side of the building I ran a bonding jumper down to the water main this was a major time and matrial savings. Here is a graphic from the 2002 NEC handbook that illustrates the possibilities. But in jsherrard's 1st post he describes " a copper 2/0 GEC will run from the 4" water main to the grounding bus"..."then a 1/0 copper GEC will connect from the bus to neutral bar of each of the 400 amp panels"
This arrangement is not in concert with the requirement of 250.24(A)(1)...See exhibit 250.8 in the 2002 NEC for some other options for the GEC connection at a premises supplied AC service. This requirement is also illustrated in the exsample that you have posted. Shortcircuit I don't know what to say. I gave you the code as written, IMO it is quite clear. I took a picture of the 2005 IAEI Analysis of changes that illustrates this new code section. Sorry for the low quality. Here is another one from the 2005 IAEI Analysis of changes.